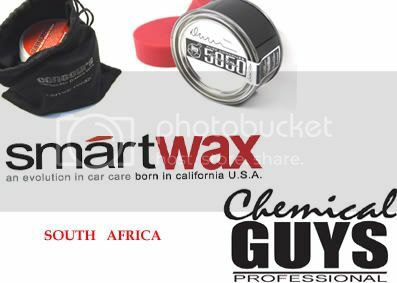 Naush is the agent in SA for Smartwax, and has offered to sponsor 3 sample bottles of product (about 90ml in size and labelled) to the forum per month. These bottles will be given to lucky draw winners each month, All the forum members names will go into a hat and the 3 drawn will get the products. All you have to do, is post a review on the forum of the product once you have tried it out. Thanks for the awesome offer, I am sure it will be put to good use ! If anyone has any product related questions or anything else for that matter please feel free to ask. I have been using Smartwax Rimwax for more than a month now and must say I am very impressed with the results. I have a long term test going in that I used the product on the Front and Back RHS and a sealer (Car-Lack/Klasse) on the F & B LHS. I want to compare the longevity of these two. Thats a fantastic test to really see what the product can do. If you need any help or questions im ready and waiting.